The project will run for three years as we assess changes in soil nutrients, and native and exotic plant cover. 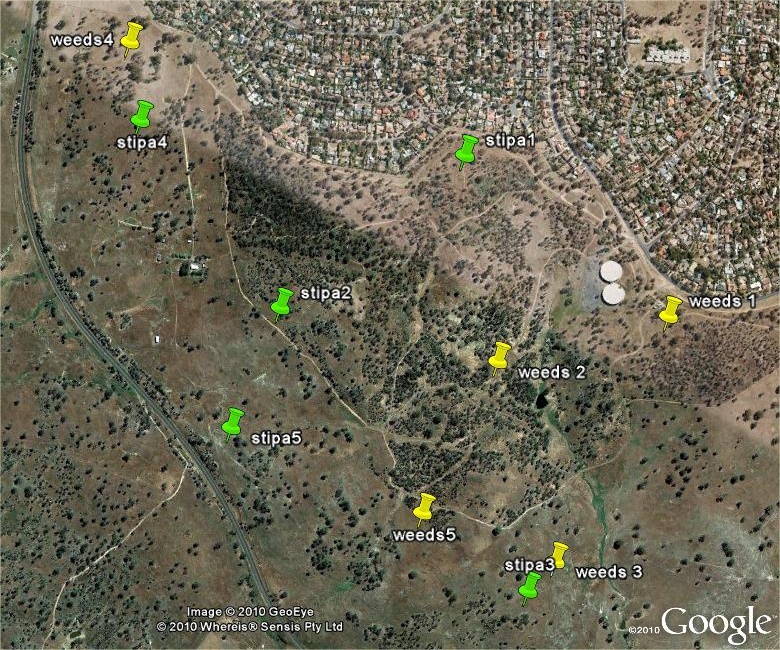 We will have ten replicate experimental blocks (see Figure 1), with five in areas with high weed cover (weed sites), and five in areas with 50-75% weed cover and >5% cover of native grass. Figure 1. Ten study sites have been established, including five that have very high weed cover (weeds), and five with some native grass cover (stipa). Figure 2. Diagram of one experimental block (of 10). It consists of two plots, each with five 5 m × 5 m quadrats and each quadrat has a different treatment. A 1 m buffer strip (which is slashed) separates quadrats. Treatments will be randomly allocated to quadrats. Percent cover of native and exotic plants (to species level). Erosion risk (using a landscape function analysis approach). Sugar: Apply 0.5kg of sugar per m2 on sugar quadrats three times per year. Burn. Burn all plants, timed to remove exotic seed sources as far as possible. 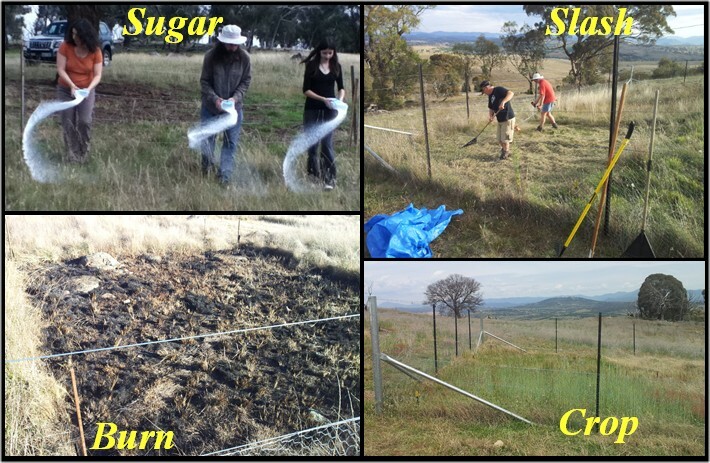 Burn plans and implementation will be undertaken by ACT Parks & Conservation. Crop. Apply herbicide or slash weeds to allow crops to grow. Direct drill (to minimise soil disturbance) a crop plant (that is sterile or will not become established as a weed itself). Harvest the crop and weigh then sample for nutrient analysis. Phosphorus is in a chemical equilibrium between available and unavailable forms. As we remove available P, some of the unavailable P dissolves from soil to which it is bound, becoming available. This means we need to know how much total P there is in weedy sites compared with sites in good condition without weeds to determine how much P we might need to remove from the soil. 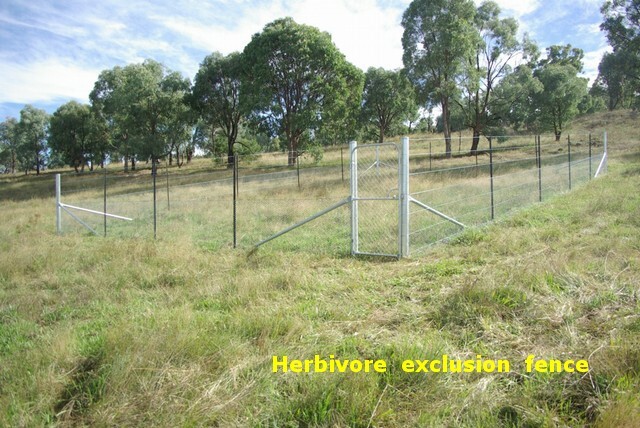 We also need to measure available P, as this concentration influences the success of many native plants. Finally we need to measure P in the weeds and crop that we remove, so that we know how many times we will need to remove vegetation to have an impact on soil P. We also need to measure Nitrogen availability (total, nitrate and ammonium), because these influence the capacity of crops to grow (and remove P), but also influence native plant success. Nutrients will be measured in each quadrat in autumn each year. The autumn measures are timed to detect maximum nitrogen levels (before annuals have started to regrow).